AccessAlly is a WordPress plugin that combines robust membership functions, course creation, student progress tracking and easy content creation for your website. It includes secure hosting of your media content including PDFs, MP3s and videos. Further, it integrates with both live and recorded Google Hangouts. AccessAlly uses ONTRAPORT's Tags to determine membership access levels while ONTRAPORT controls all messaging and automation, including triggered Rules that grant or revoke membership access. Usernames and Passwords are generated by AccessAlly and stored in ONTRAPORT. We recommend not using AccessAlly and ONTRAPORT's PilotPress plugin at the same time as they could interfere with each other. A stand alone WordPress website. Note: This video references ONTRAPORT at 11 minutes. Configuration is easy. Please note that these instructions differ slightly from those in the video, in that they collect all relevant information from ONTRAPORT in the beginning instead of throughout the process. Check to see that Wordpress is enabled in Administration > Advanced Features. Navigate to Administration > Integrations > Wordpress Website. Click the New WordPress Site button. Select the Existing Wordpress Site option and click Create New to create a new entry for your existing site. Enter the name of the site and the Website URL. Do not configure any membership levels. Click Save. Click on Administration > Integrations > ONTRAPORT API Instructions and Key Manager. 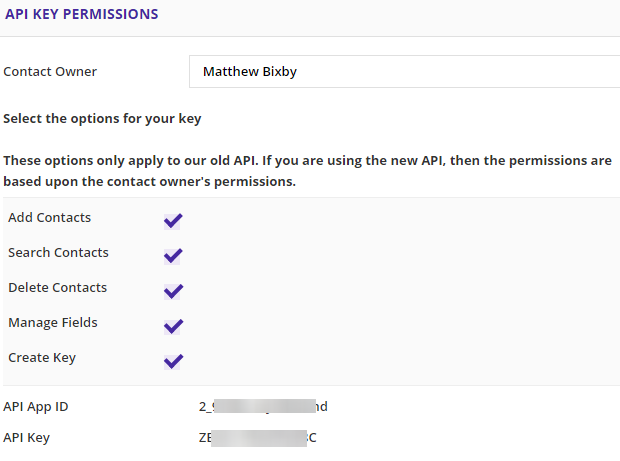 Click on the name of your website to open the API Key Permissions editor. Select a Contact Owner from the drop down, then check off all of the permissions. Copy the API App ID and API Key numbers to a text file for use in AccessAlly later. Click Save in the upper right. AccessAlly needs a custom field to store the Contact's password. Click Contacts > Settings > Field Editor to add a new field. Add a text field named "AccessAlly Password". Save the field and remember to click the Save button in the upper right. 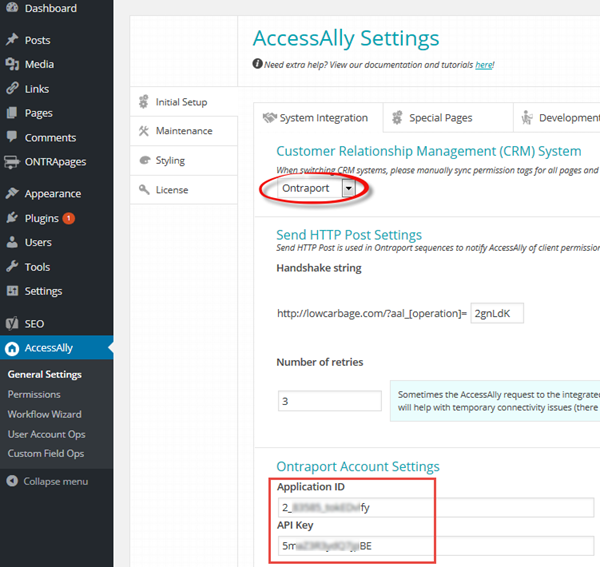 In the WordPress administration section, select AccessAlly and General Settings. On the Initial Setup tab select ONTRAPORT from the drop down box at the top and copy and paste the Application ID and API Key into the ONTRAPORT Account Settings section. At the bottom of that page, select the AccessAlly Password field from the drop down under Password Field. Click Save Changes at the bottom. 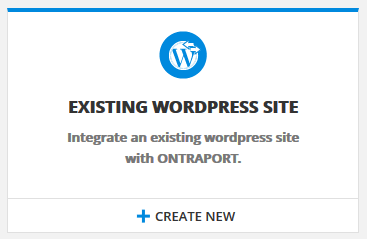 AccessAlly and your WordPress site should now be integrated with your ONTRAPORT account. Check out AccessAlly's article on how to create a welcome Campaign that grants access to your membership site after successfully filling out an ONTRAPORT form. See AccessAlly's article on how to setup a refund or revoke access to your membership site in ONTRAPORT. Q. Can I use AccessAlly with PilotPress membership sites? A. No, do not combine both AccessAlly and ONTRAPORT's PilotPress plugin as they could interfere with each other. Q. I am using an ONTRAPORT Step Sequence to add a lot of users to a course, but not all of them are getting added. What am I doing wrong? Q. I'm migrating from another CRM system and using AccessAlly. How do I switch CRMs and keep the same AccessAlly site? A. Check out this AccessAlly article for instructions on how to do this. How i get my all ontraport users to wordpress or i need to add an registration form and manually add the ontraport contact id but that should be automatic? please suggest more on this. Hi Mary - AccessAlly uses a "Ping URL" (webhook) to send the membership information to the WordPress site. The video above, at 11 minutes, has the process. While they describe using the Step Sequence and a Rule to send the Ping URL after a form fill out or purchase, you could also create the same Step Sequence and simply subscribe all (or a Group of) your Contacts to it.